92 • RV PRO • September 2018 rv-pro.com R V M A N U F A C T U R E R S As a result of the findings, Jayco created more than 60 new quality-related jobs and implemented an executive warranty committee and an executive quality audit program. "We want everybody to take ownership on what quality looks like," Thompson said. 2019 Towable Offerings Jayco has plenty of new innovations across the board for 2019, but perhaps the nameplate that gathered the most atten- tion during the event was the entry-level Hummingbird. Two floorplans in particular – the 10RK and the 17MBS – position the line to compete well against the growing teardrop market and the smaller trailers put out by several independent manufacturers. The 10RK is only 74 inches by 54 inches on the interior, but also has an external kitchen with a refrigerator and TV that can run off battery power or 120 volts. It has the option for a side-mounted air conditioner and comes standard with a Fantastic Vent and rooftop solar prep. The faucet in the rear kitchen is removable and can be replaced with a hose. 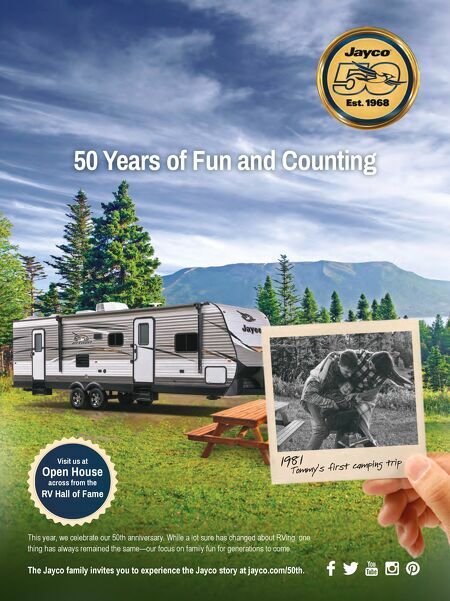 "We've had camping trailers around since 1968," said John Fisher, senior director of product development for fold-downs and lightweights. "But with today's camper that doesn't want to take all of that time to set up the pop-up, we need some- thing that we can go after the 2,000-pound tow-rating. They don't want a tent camper, but they want some sleepable space." MSRP for the 10RK is around $12,000. The 17MBS makes the most of what it has by tucking a Murphy bed in the front of the trailer and adding a sofa to make for some livable space. "We wanted to make as much livable space as we can," Fisher said. "This size trailer doesn't usually have sofas." The 17MBS has a smaller kitchen than some similar Hum- mingbird floorplans, but that allows for it to have a dry bath, which is unusual in small teardrops. All Jayco towables, including the Hummingbirds, are equipped for 2019 with the Jay SMART (Safety Marker And Reverse Travel) lighting system. This places marker lights around the trailer that offer lighting for backing up and also flash around the trailer when turn signals are activated. MSRP for the 17MBS starts at around $20,000. At the other end of the spectrum, Seismic's 4125 adds a little luxury to the toy hauler crowd. In addition to appointments that are to be expected from a toy hauler such as a 12-foot garage with HappiJac bunks that lower on an electric motor, Seismic has some more upscale touches. A large kitchen features the Furrion Master Chef collec- tion of stove, microwave and oven as well as a 21-cubic-foot Jayco sales representatives work with dealers to help them place orders during the company's 50th anniversary dealer show and sale at the Indianapolis Convention Center in August.